Thank you for joining us for the Thinking Of You Challenge and we hope you will all join us again this week too. This week we are showcasing Tim Holtz Products. You don’t have to use them for the challenge but if you have them we would love to see them used. 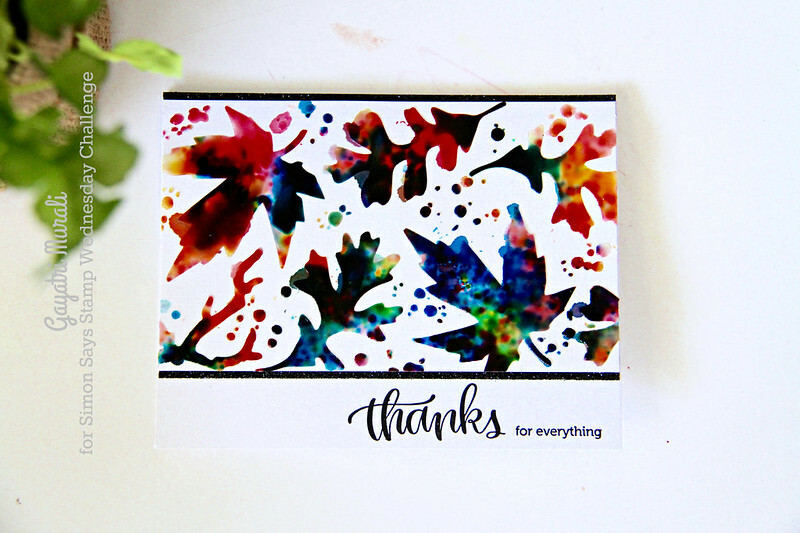 I used the new Autumn stencil from Tim Holtz to make my cards. Yes I have three cards. Three different ways to use the stencil. So grab a cuppa and enjoy! My first card showcasing the stencil using watercolour technique. I placed the stencil on the watercolour paper and dusted some Color Burst watercolour pigment before straying with water. I let it sit for about 30 to 40 seconds before I pat the watercolour with a towel. Love the effect this gave. Some of the leaves have full colours on them, some partial and some literally a dash of colour. The variation is awesome. I stamped some text on the background randomly using a brown ink. Trimmed the panel smaller than the card front, roughed the edges with scissors, sponged the edges with Gathered Twigs distress inks. I adhered this panel on a kraft card base using foam adhesives. Sentiment is SSS Grateful die. The outline is diecut using brown card stock and the Grateful die is die cut using white card stock and brushed with Copper shimmer ink. I tied natural twine below the sentiment and embellished with Gold sequins. On my second card, I sponged distress inks on the stencil, applied translucent embossing paste and glitter on top of the embossing paste before the paste dried. Because the embossing paste is translucent, the sponged distress inks shows through and the glitter makes the texture glittery 🙂 Beautiful texture and colours. I trimmed the panel, added a thin strip of woodgrain pattern paper before adhering on the card front. I then white heat embossed the sentiment from the stamp set from November card kit on green strip of card stock and adhered on the top centre of the panel. embellished with Espresso sequins and orange twine on the card fold. The third card uses a technique inspired by Heather Telford’s Stained Glass card. Thanks Heather for sharing the wonderful technique. 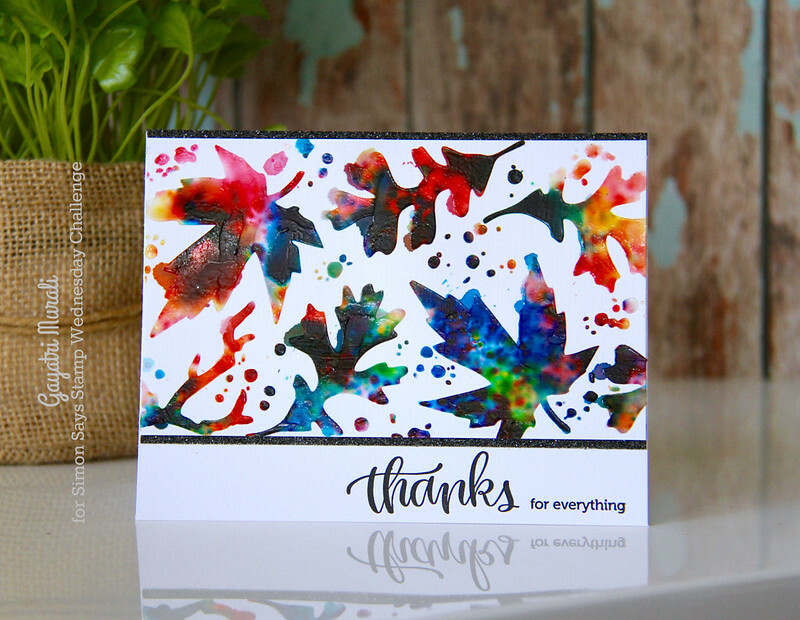 I applied the translucent paste on the stencil and white still wet I sprinkled some Color Burst watercolour pigment. I used four different colours of Color Burst – Allzarin Crimson, Burnt Orange, Yellow Ochre and Ultramarine Blue. Then sprayed with water. Not a lot of water just a couple of sprays to get the pigments dilute and blend. I removed the stencil and let the panel dry. I kept the rest of the card simple so make the brilliant blend of colours make the impact. Here you go. Three ways to use a stencil! Hope you are inspired. Stunning cards Gayatri. The stain glass one is incredible. Just love the bright colours. these are stunning! have a great weekend!